BIRGUNJ, March 21: Birgunj Customs Office, the main collector of customs revenue, has lagged behind in revenue collection. 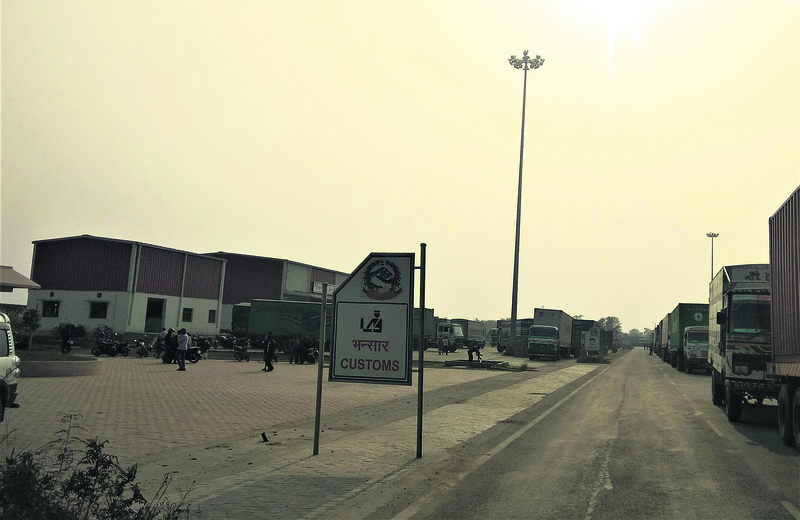 The customs office along Nepal-India border failed to meet revenue target in the first eight months of the current fiscal year due to lower-than-expected import growth from this custom point. According to data compiled by Birgunj Customs Office, it managed to collect only 93.45 percent of the targeted revenue over the first eight months of the current fiscal year. The office could collect only 81.61 percent of the targeted revenue in the eighth month (mid-February to mid-March, data shows. The government has collected Rs 101.28 billion over the first eight months of the current fiscal year form this customs office compared to the target of Rs 108.11 billion. Out of the revenue target of Rs 15.44 billion set for the Birgunj Customs Office, the major customs office fall short of Rs 2.84 billion of revenue in the month of Falgun (mid February to mid March). “The lower-than-expected import of some commodities, which are major sources of revenue, weighed on the revenue,” said Shyam Prasad Bhandari, Chief Customs Administrator of Birgunj Customs Office, told Republica. “Our prediction that the custom revenue will improve from Falgun did not materialize. Low import of raw materials and vehicles has hit revenue collection,” he added. Stating that the revenue target was 27 percent higher than last year, he said that import growth of major products in line with the higher revenue growth target would have only led to the achievement in revenue collection. According to the data, the import of the motor vehicles, which is the major source of customs, has gone down 13.67 percent in the review period compared to the corresponding period of the last fiscal year 2017/18. The import of four-wheelers fell to 6,612 units in over the first eight months of the current fiscal year from a total of 7,600 a year ago. Similarly, the import of clinker - a raw material for cement manufacturing -- also dipped by 35.22 percent to 649,956 tons. The import of other raw materials has also slowed in the current fiscal year. Automobile chassis fell to 35.69 percent to 1,740 in the current fiscal year, the customs office data shows. The growth of fuel import has also not improved much. In the current fiscal year, there was not any import of hydroelectricity equipment and machines while these imports were one of the major contributors for the customs revenue last year. Officials blame the government's poor performance in capital spending and development projects to slowdown in import and revenue growth.